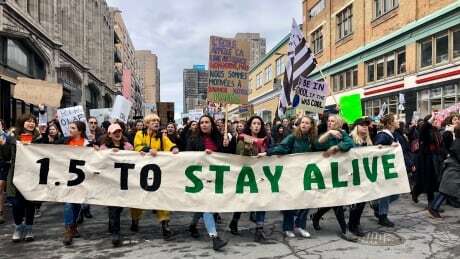 Tens of thousands of young protesters marched through Montreal on Friday as part of climate change demonstrations taking place around the world. Marches are also being held in other Canadian cities, including Toronto, Vancouver, , and , but Montreal's appears to have been the largest. Greenpeace estimated the crowd to be be at more than 150,000 people. The co-ordinated "school strikes" being held in more than 100 countries were inspired by 16-year-old Swedish activist Greta Thunberg, who began holding solitary demonstrations outside the Swedish parliament last year. Since then, the weekly protests have snowballed from a handful of cities to hundreds, driven by social media-savvy students and dramatic headlines about the impacts of climate change. 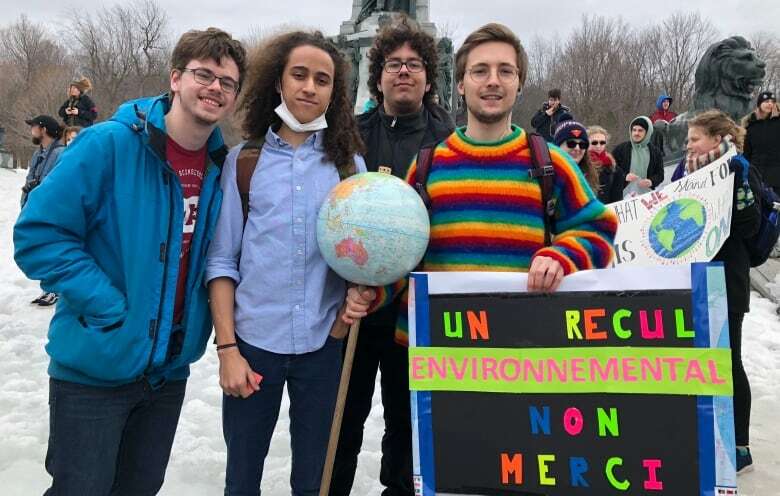 High school students in Montreal have been holding climate marches every Friday afternoon for several weeks. Some have been penalized for cutting classes, while others have been encouraged by their schools, teachers and parents to attend. Before the march got underway, organizers took turns on a loudspeaker set up near the monument at the foot of Mount Royal. "We are declaring an environmental emergency," one said. "We are more mature than you," said another, echoing Thunberg. 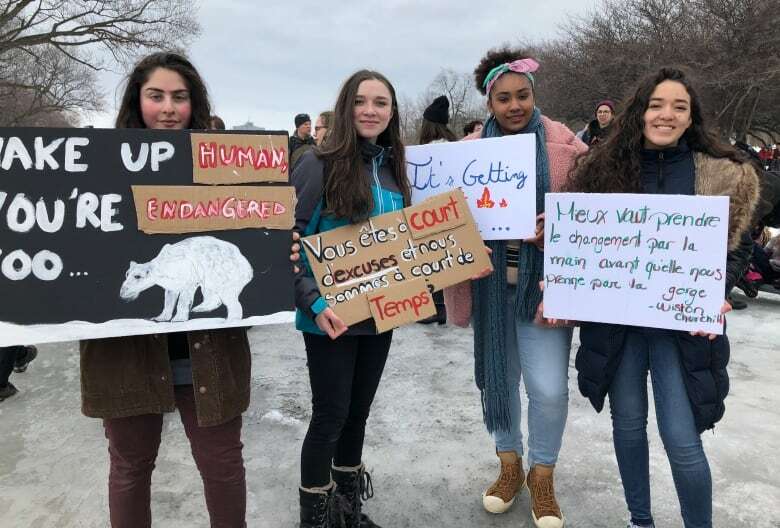 Rose Kahhali, Binetou Sarr, Rebeca Corona Blanco, all 17, and Mathilde Legault, 16, skipped classes at their high school in Laval, Que., to attend the march. "Classes may be for our future, but we won't have a future to look up to if we don't come to protests like this," said Rose Kahhali. "It's by making big actions like this, to draw people's attention, that we'll be able to make lasting change," Binetou Sarr said. 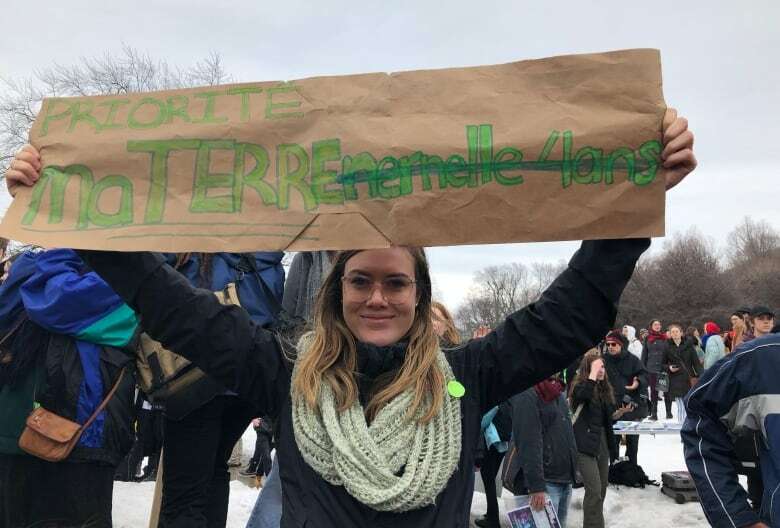 One of the march's organizers, 17-year-old CEGEP student Émilie Vandenbegine called for more political action from local governments on climate change. Vandenbegine said her team had estimated 60,000 people would attend, based on the number of student associations they were in touch with. "We're very proud because we put this thing together in a really short time. The outcome is really, really positive," said Vandenbegine, as students tapped on makeshift drums. "Hey, hey, ho, ho, let's change the world. Let's go!" they chanted, and: "Climate change is not a lie; please don't let our planet die." 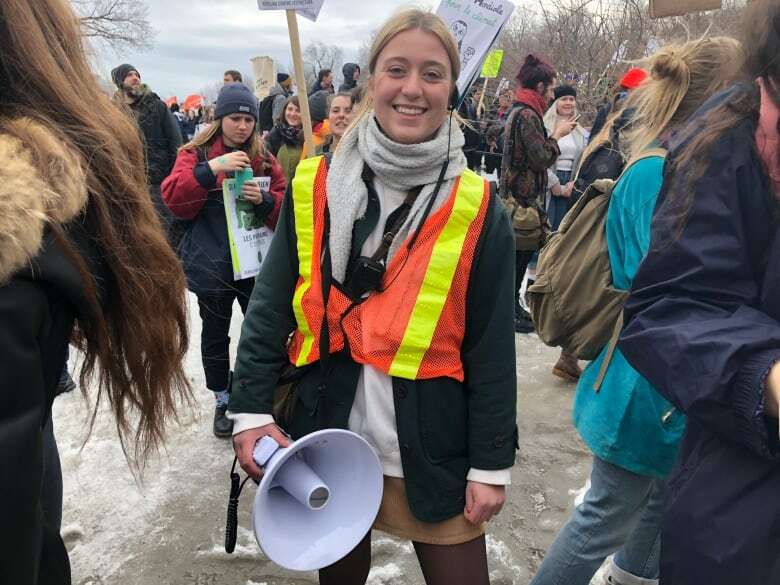 Université de Montréal law student Anne-Frédérique Perron, 21, held up a sign that made reference to one of the issues Quebec's government has prioritized — making in the province. Perron said the government should put more emphasis on protecting the environment and enacting policies that will seriously restrict greenhouse gas emissions. "It's ridiculous. We're in 2019, and we have a government for which the environment does not exist," she said. "We can no longer allow ourselves that. This is a matter of survival. "The idea of having kids has become an anxiety because we wonder, 'Will they be able to die of old age?'" Friday's march was the first protest Thierry Poulin ever attended. He said he was motivated by the idea that change is enacted through collective action. "I'm not using straws — but I'm not going to change the world [that way]," Poulin said. "We need to act on some other level, and that's why we're here today." 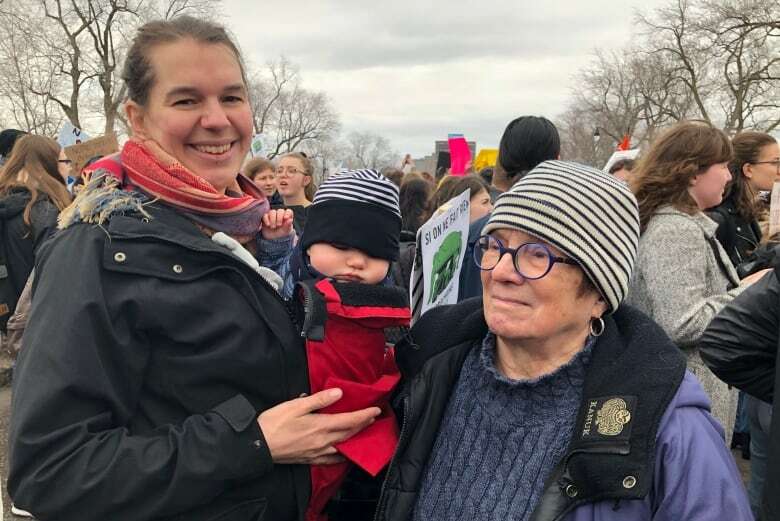 With five-month-old Constance in her arms, Ève-Lyne Couturier, 37, waited with her stepmother, Barbara Lapierre, 73, for the march to begin on Parc Avenue. "It's her future we're talking about," Couturier said of her daughter. "Having a child right now is kind of a strange thing because I don't even know if she's going to have an environment that is going to be decent to live in. "I think it's important for her to be here and to be inspired in a way, and I hope that when she's older, she's going to do the same." Scientists have warned for decades that current levels of greenhouse gas emissions are unsustainable, so far with little effect. In 2015, world leaders agreed in Paris to a goal of keeping the Earth's global temperature rise by the end of the century well below 2 degrees Celsius. Scientists now argue that keeping below 1.5C is a far safer limit for the world. Yet at present, the world is on track for an increase of 4 degrees Celsius, which experts say would have devastating consequences for life on the planet. Pure Life Keto : The increases your energy level to be longer in your workout session.